From rock festival party to potential rock throwing confrontation, in the blink of an eye. 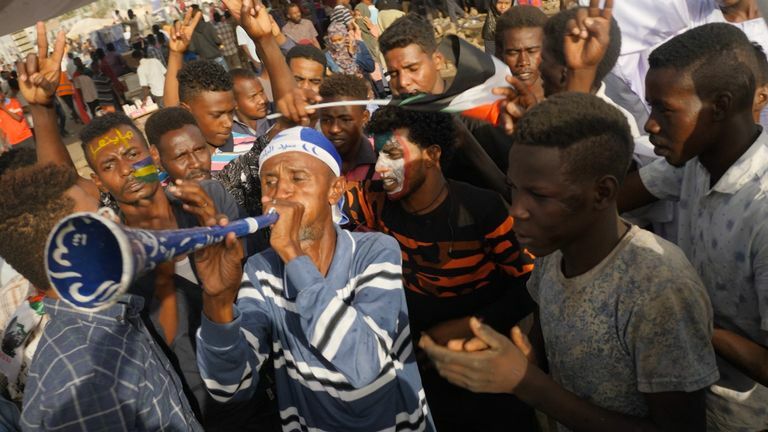 The Sudanese revolution got its anger back and the “kids” are preparing for battle. The military council isn’t listening and they are determined to make it hear – just as they have done for the past 120 days of defiance. Even as we walked to the protest site, through the barricades they refuse to take down, past the checkpoint volunteers searching everyone’s bags, towards the various speakers addressing small and large groups of demonstrators, you could feel the difference. There is a steely determination, there’s an anger in their chanting. It has replaced the joyous uplifting song of celebration that made us smile hour after hour, day after day. There is a defiance and an anger in the air. Make no mistake: everyone is absolutely lovely to us, but they aren’t smiling like they have been for the last week. There is a steely determination, there’s an anger in their chanting. It has replaced the joyous uplifting song of celebration that made us smile hour after hour, day after day. The breakdown in talks between the protesters’ negotiating teams and the military council has come as a reminder to the thousands of people involved, that the road to this revolution, already pockmarked with the deaths of so many, still stretches into the distance. The sense of unease is not helped by the ever present sight of very heavily-armed militia fighters. They are everywhere. Every road, every roundabout, every junction and every bridge across the Nile is controlled by uniformed men carrying machine guns, on trucks with 50 calibre machine guns and carrying more rocket propelled grenade launchers than I have ever seen in one place at one time – and, trust me I have seen a lot. This is not the regular army. They are the so-called Rapid Support Forces, the RSF. It’s an acronym synonymous with brutality and fear. They are a militia created by the now deposed dictator Omar al Bashir. Once his own private army, they are the force that effectively carried out the coup against him. Now they say they are protecting the revolution and the protesters. They surround the protest site. In truth nobody really trusts them, but for now they are there and there isn’t really much anyone could do about it even if they wanted to. An order from the military council for the barricades to be dismantled and the roads to be opened, was obviously ignored. But the effect has been to cloak the camp in an atmosphere of nervousness and paranoia. Social media posts warn of phantom camp clearance operations sending shivers through the crowds as they brace for non-existent trouble. A shout and a sudden movement of people can turn into a furious stampede as people run to help. In one instance a poor soul had fallen into a canal of sewage, hundreds ran forward, only a few gingerly helped him out. The suspension of the negotiations has changed the whole dynamic in the protest zone. What feels like a world away, but is still within the protest zone, is the campus of the University of Khartoum. Built by Lord Kitchener in 1902 as a memorial to General Gordon of Khartoum, it is a beautiful – if slightly dilapidated – haven of cool cloistered walkways and classrooms; it’s also home to the so-called “godfather of the revolution”, Professor Muhammad Yousif. We spoke for an hour, the drums, trumpets and roars of the protesters ever present in the distance. He firmly believes that some members of the military council are determined to undermine the revolutionary process at all costs and are imposing problems on the negotiating process in an attempt to ensure that the old regime survives in some form. “They have no intention to submit power or transfer power to civilian administration, any civilian administration,” he told me. He told me that the military council had decided almost immediately to say that they could not hand over power because there were too many differences between the opposition groups. He says that there have been two incidents of major differences but that they were overcome, and that the opposition remain united. The professor said that talks would resume, implying that the current break down was more about manoeuvring. He said that they decided to go back to “Square One” to send a clear message to the military that they were not prepared to compromise. “That is why we are exerting this kind of pressure, for them to go away,” he said. I asked him if the positioning of the opposition could lead to the loss of more lives. “We are ready for that. We are ready to give more sacrifices for our country. This is the fate of our country, this is the destiny of our country and we are determined to regain the dignity of our country and to put our country in the place it deserves,” was his stark reply. The most optimistic here really do hope that the talks breakdown is more about manoeuvring than confrontation. Out in the crowds they aren’t so sure. But one thing is for certain: they aren’t going anywhere. The carnage in Sri Lanka, one of the worst terrorist atrocities this century, could signal the start of a new campaign of “spectacular” attacks around the world. There have long been warnings that Islamic State militants, many trained in explosives and guns after time spent fighting in Syria and Iraq, could attempt such a move following the collapse of their so-called caliphate last month. Al-Qaeda and its affiliates similarly have the know-how to direct a coordinated barrage of suicide bombings in multiple locations, as happened in Sri Lanka on Easter Sunday. But no international terrorist group has yet claimed any involvement, which is unusual. The 9/11 attack on the US by al-Qaeda was the most notorious “spectacular” act of Islamist terrorism in living memory. Other high-profile incidents include the Mumbai attacks in 2008, carried out by a militant Islamist group called Lashkar e-Taiba, in which more than 170 people died, and the Bali bombings of 2002, again by Islamist extremists, which killed more than 200 people. Islamic State was linked to the bombing of Coptic Christian churches in Egypt on Palm Sunday two years ago, in which dozens of worshippers perished. The Sri Lankan authorities have named a little-known local Islamist group as being behind the bloodshed in churches and at hotels at this popular holiday destination, caused by at least seven suicide bombers. But there is no doubt that international terrorist expertise played a part in helping National Thawheed Jama’ut, also known as NTJ, if they are proven to have been the culprits. The local group previously had only been linked to vandalising Buddhist statues – a long way away from killing and maiming hundreds in a coordinated attack involving multiple targets at the same time. Sri Lanka is struggling to understand how this could have happened on its soil. There are signs that warnings may not have been sufficiently acted upon. The country’s police chief is said to have issued a warning on 11 April – nine days before the bombers struck – saying a “foreign intelligence agency” had reported a little-known local Islamist group was planning attacks on churches and the Indian high commission. It is not known what action this tip-off generated within the police. However, Prime Minister Ranil Wickremesinghe had not been made aware of the report, according to a fellow minister. There is a rift between him and the president, which sparked a political crisis last year. The prime minister has since been kept out of intelligence briefings, which could be why he was unaware of the warning. The police say they plan to investigate whether any intelligence reports of the possibility of an attack were missed as part of their wider investigation into what happened. British, US and other intelligence agencies will be working hard to identify possible links between the Sri Lanka bombers and any known foreign individuals or groups. They will be aware that other similar attacks could be just a matter of time. The fresh “breach of trust” indictment against Carlos Ghosn comes as prosecutors expand on their allegations of financial misconduct outside Japan. The new charges accuse him of trying to enrich himself, as Nissan’s chairman, to the tune of $5m (£3.8m) at the company’s expense. It is alleged that he siphoned off a portion of the money that was meant for the car manufacturer’s overseas sales agent. Tokyo District Court said his lawyers had requested bail after charges were filed. Ghosn has been in custody since his arrest earlier in April for a fourth time. The 65-year-old has maintained that he is innocent of all charges and that the payments made to Nissan’s subsidiaries were legitimate business transactions. He has also denied the charge that he under-reported his salary, saying they were payments that were never paid. Nissan says it has filed a criminal complaint against its former chairman and determined that the payments in question “were in fact directed by Ghosn for his personal enrichment and were not necessary from a business standpoint”. Ghosn, a citizen of France, Brazil and Lebanon, was released on one billion yen (£6.8m) bail in early March under strict conditions. Prosecutors rearrested him a month later. Nissan’s French partner Renault sent Ghosn to the Japanese car firm 20 years ago to turn it around when it was facing bankruptcy. Nissan is 43% owned by Renault, which is partly owned by the French government. In a video statement released this month after his arrest, Ghosn accused some Nissan executives of plotting against him out of fears that Renault would take over the Japanese company.